Once again, UK Poker News delves into the pool of up-and-coming poker stars and pulls out another fine example; Oliver Boyce, a 31-years old software consultant from Dublin, Ireland, made a splash in 2005 by winning outright the World Speed Poker Open - which was conceived and televised by The Poker Channel - beating off some tough professional competition. In Part 1 of this interview, Oliver talks about his introduction to poker and how he came to beat a field of top professionals to claim the World Speed Poker Open at a cost of just $3......!! In Parts 2 and 3, to be published later, Oliver explains how he has built upon his Speed Poker success to claim a seat at this year's WSOP Main Event, the excitement of playing some of Ireland's best tournaments and some of his secrets to playing profitable online poker, and more.........watch this space. UKPN: Hello Oliver, thank you for taking some time out to chat with UK Poker News. OB: No problem, it's great to get the opportunity to talk to UK Poker News and your readers, it must mean I'm doing something right on the poker table. UKPN: Can you tell us a little of your background? OB: I'm 31 years of age, trained as an accountant but now work as a software consultant in financial systems for a company called Autoview in Dublin, which is also based in the UK. I am a 16-handicap golfer and a keen sports follower. I am from Buncrana in Donegal but now live and work in Dublin. I now play poker semi-professionally, which means I make as much from poker as work, but still work for a living. I also am a member of the "Boards.ie" forum, which is the main forum for poker in Ireland. UKPN: Can you tell us how you got started in poker? OB: This is a long story, I come from a family of card players and my granny thought me how to play rummy, then 25, 45, Blackjack and then poker, which was 5 card draw at first and then stud poker etc. About 2 years ago I was on a business trip to Vegas and found a poker room in the Luxor hotel, that got me started and when Paddy Power Poker started last April, I started to play online. Since then, I've joined a few casinos and poker clubs around Ireland. Unfortunately, my Granny is not alive to have seen me win the World Speed Poker, as I know she would have got a great kick out of it. So I'm now playing poker for about 25 years, but only seriously in the last year. UKPN: Many people reading this may have first seen you on The Poker Channel last year winning the World Speed Poker Open. How did you qualify for this tournament in the first place? OB: I qualified online for $3. I entered a rebuy $3 event that had a ticket worth $110 as the prize, and this had about 60 runners. I then played the final the following Sunday online and won the $4,000 ticket to the TV stages. When I sat down for the final on the Sunday night I had a good gut feeling about the event that I was going to win, so I was jumping around the room when I won the heads up. About 6 players from Ireland qualified, so we all went over together with the Paddy Power staff. It was my first attempt to try and qualify for a major event online or live. It was the start of a big change in my game as the following Sunday I won the main online event on Paddy Power at the time, winning another $3,000. I think my winnings for that week was over $7,500 and I was in shock, as I had never won that much before. But it was the start of a great 5 months of poker for me where I won over &euro;100,000 including the World Speed Poker Open title. UKPN: At the World Speed Poker Open, you were up against a host of top players such as Tony G, Dave Colclough, Lucy Rokach, Kevin O'Connell, Scott Gray, Rory Matthews and Jac Arama, which must have been quite an experience for you. Can you describe how it felt to be starting play at the same tables as these professionals and what you did to handle the emotions and pressure of being live in front of the cameras at the same time? OB: I've played sports at a high level in Ireland before and had been involved in sporting events on television before, so it was more excitement than nervousness. I'm a very confident person, so I just put my head down and stuck to my own game. At the time, I didn't have Sky, so I didn't know who these players were, as I was mostly playing online. People kept saying to me about Tony G and Dave Colclough, so I supposed this helped as I had no fear of these players. But now I know what I was up against and Tony G is one of my favourite players now. But you can't fear other players and worry about them because they are sitting there worried about you, so get on with the game and wait for your chance. It only takes one hand to knock a pro or any player out and the speed poker suited me due to the speed issue. I've great respect for the pro players and I owe a lot of my win to Scott Gray and Kevin O'Connell who gave me loads of good advice after my heat win. These guys are two real gentlemen and couldn't help me enough. 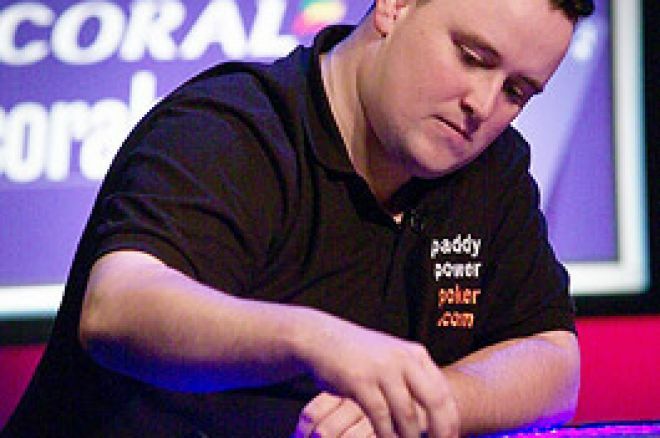 Scott is one of greatest Irish players of all time and I would love to see him back on the circuit as I think he's playing better poker now than he was 10 years ago. I think the whole experience will stand to me, playing on television, learning the game from great players, dealing with the win itself and dealing with the media and other player's reactions. It was all plusses for me and I can't wait to defend my title later this year. UKPN: Were there any specific hands played out that stick in your memory and helped you make progress at the World Speed Poker Open? OB: There's one hand in particular when I had pocket 10's and hit the trip 10's on the flop and the board paired the 9 to give me a house, I was just hoping that Michael McFadden had the other 9 and I couldn't believe it when he had the ace also. This hand in particular won the tournament for me as it gave me the chip lead, which I held most of the way from that stage on. At that stage of the tournament, I needed to double up as the blinds would have increased and put me under pressure. After that hand I could raise and gamble a little bit more freely. If he had the pocket aces, it would have been very hard for me to get away from that hand also, so it was the main turning point in the tournament for me. The other big hand was when I went all-in against Emile (Petit, the runner-up), he had stolen the blinds and had been raising my blinds for a couple of hands in a row, so I knew I needed to make a stand. So the first two decent cards I got I was going to limp and come over the top of him, knowing that he would lay it down. Like clockwork he raised my blind and I announced all in and he started looking at my chips. I knew straight away I was behind, so I started acting as if I had a massive hand (power play). When he asked how much in chips I had, I told him like a shot, trying to act as if I wanted the call. It worked and he laid the hand down. These were two key hands in the final that won the game for me. I was also lucky against Kevin O'Connell twice, once when I rivered a 10 to hit two pair in the heat. UKPN: The Speed Poker structure is a radical change from the usual tournament format involving as it does a pair of dealers on the table and a short time to respond to bets. What is your overall impression of the format and do you see it becoming more popular? OB: I'm very positive to it. I've played this since live and it doesn't work as well as it does with the big budget and the TV studio. I think the Poker Channel ran a brilliant event and well done to them. I think it's a better game for television as it lets the players play more hands in a shorter period of time. I didn't hear one player, pro or qualifier, complain about the format and it already seems to be catching on. I think it's here to stay and will become more mainstream in the future. UKPN: Has winning the tournament and playing against such highly regarded players helped your overall game improve? OB: Yes, very much so. I have a better read on players, I have learned to change gears easier, I've adapted to playing more aggressively and I'm not scared to come over the top of someone. Also, all the help I got from the pros has improved my game greatly. I reckon I'm easily 300% a better player now. It also helped greatly in dealing with the pressure of playing and I don't think I would fear any table or event now. Ed note: In Part 2, Oliver tells of his WSOP satellite win. Join Bet365 Poker for your chance to do the same - for every WSOP event!